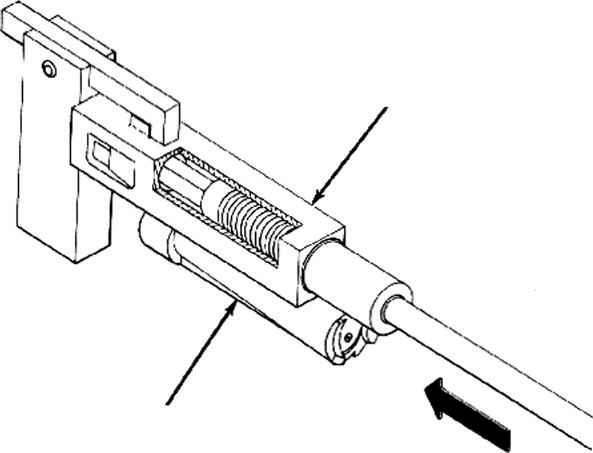 In order to determine the impulse applied to the gas piston, let it be assumed that the diameter of the piston in the example gun is equal to the bore diameter, or approximately 0.79 inch. (This is the rule of thumb often used in the design of gas-operated weapons.) The area of the piston will then be approximately 0.5 square inch. The force exerted on the piston at any instant can now be determined by multiplying this area by the pressure for that instant shown in fig. 3-5. The force-timc curve which results from plotting these values is shown in fig. 3-7. If it is considered that the only significant force initially acting on the piston is the pressure of the powder gases, the total impulse applied to the piston up to any instant can be found by measuring the area under the curve of fig. 3-7 up to thai instant. The resulting values of impulse can then be used to plot the impulse curve shown in fig. 3-8. Note that the total impulse applied to the piston for the sample conditions is equal to 5.13 pound seconds. The amount of energy imparted to the piston by this impulse will depend on the mass of the piston. The lighter the piston, the greater will be the energy produced by a given impulse.